The Department of Occupational Therapy was the first non-teacher education program at Western Michigan University and it continues to break ground as one of the top 50 such programs in the nation, as ranked by U.S. News and World Report. WMU offers an undergraduate professional entry program at the main campus in Kalamazoo and a professional entry graduate program offered at main campus and also at our regional location in downtown Grand Rapids, Michigan. The program is accredited by the Accreditation Council for Occupational Therapy Education, and two WMU professors were inducted into the roster of fellows of the American Occupational Therapy Association at its annual conference in April 2016. Dr. Diane Dirette and Dr. Amy Wagenfeld joined Dr. Debra Lindstrom, inducted in 2014, in this prestigious fellowship of professionals. In 2015 the department attained a 100% graduation rate with 96 out of 96 admitted students in the cohort crossing the stage to receive their Master’s diploma. Since U.S. News & World Report lists occupational therapy as number 10 in the top 25 best jobs, these alumni of WMU’s OT program are sure to get placement in jobs after they take the National Board of Certification in Occupational Therapy exam and move into the workforce. Graduates already get plenty of experience; after 22 months of academic study in which they attain 66 credits, they do a six month fieldwork experience for six credit hours. Part of their final work includes a research project that culminates in a poster presentation as part of OT Poster Day. 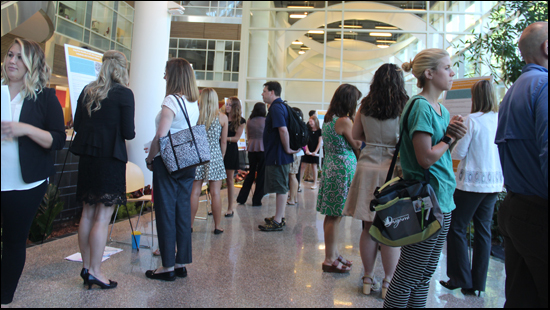 This year the event was held on June 21 in the lobby of the College of Health and Human Services. Sara Clark, Occupational Therapy Fieldwork Coordinator, explained that each student pairs up with another student whose interests are similar, and together they examine a question that has been posed by clinicians in the field. The finished product is called a Critically Assessed Topic, or CAT. The team produces a poster showing the results of their findings, which explore research that has already been done on that topic. For instance, students Gabrielle Lober and Rachel Walker assessed the most effective cognitive screening tool for patients on ventilators. Brandon Lubish and Patrick Yee looked at the effectiveness of extracorporeal shock wave therapy on burns and scars. Kathleen Nickens and Ceara Fauble examined age, frequency, and precautions in relation to stimulation in the NICU. Each team must use the same format, and some produced brochures and handouts on their topic. They must capture the objective of the research question. They must list the databases and sources they used to assess the research in the field and define the research criteria as well as any exclusion criteria. Then, based on the findings, they list the main results and implications of the research on that question. Students also put their topic into context in a background section. The result is a professional effort that links them to cutting edge research in their field. 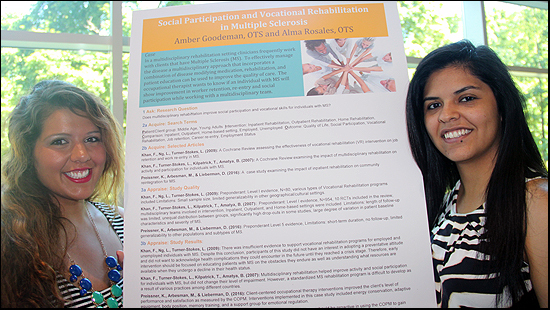 Alma Rosales and Amber Goodeman addressed the research question “Does multidisciplinary rehabilitation improve social participation and vocational skills for individuals with Multiple Sclerosis?” Both women completed their Bachelor’s degrees at Western Michigan University and went on to pursue an advanced degree in the field of occupational therapy to fulfill a childhood dream and a promise to their family. Rosales was born in Mexico and migrated with her family to Michigan when she was eight. She is very thankful for their support as she became the first person in her family to go to college. Goodeman was raised by her single mother in Frankenmuth, Michigan. She overcame hardship and maintained her educational goals after the death of her mother three years ago. Both Goodeman and Rosales profess a deep desire to help others through their work, and both wish to work with children. Goodeman had an opportunity to study abroad in Ireland and in Jamaica, and there she encountered children who had no access to health care. Her dream job involves working with children in a pediatric facility where she could implement hippotherapy, in which horseback riding is used as a therapeutic or rehabilitative treatment. Rosales would like to use her bilingual and bicultural skills to provide services to minorities, increasing access to healthcare and improving health outcomes for underrepresented populations. Rosales is a recipient of the Thurgood Marshall Fellowship, a competitive award through the Graduate College that supports diversity among students pursuing graduate degree at WMU.